I did this walk on Monday 31st January 2011. I had made my way by bus, tube and the Docklands Light Railway to Woolwich Arsenal from where I walked down past the market towards the A206 , before cutting down to the Thames path extension which I then followed up to the Thames Flood Barrier. Unlike my last walk along the Green Chain the day started very grey and cloudy although the clouds did break up towards the end of the stage. Just past the Woolwich Ferry there was one new stretch of path, photo 1, that had been opened up along the riverbank since I had last walked here although a little later on the route still has to divert up to the A206 for a short distance on its way to the Thames Barrier. It was however an interesting walk with lots to see. 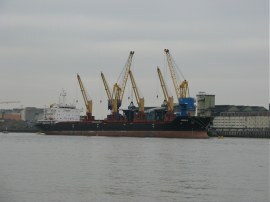 There was a large boat, photo 2, the Rodina moored on the opposite bank of the Thames by one of the Tate and Lyle Factories in Silvertown; one of the last few remaining active industrial sites on this part of the river. 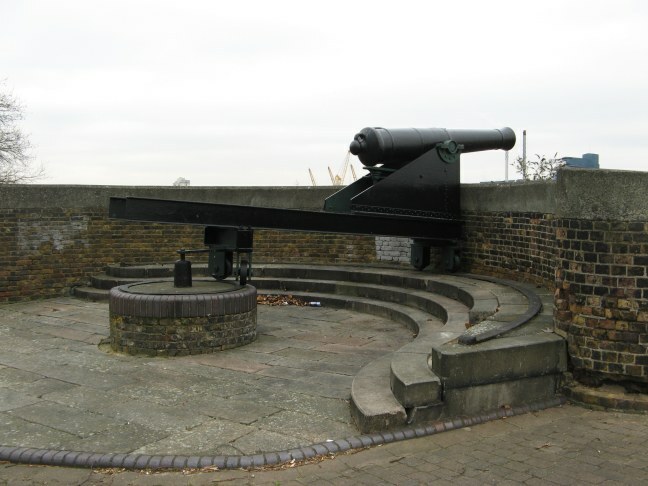 The heritage from the former Woolwich dockyards was also much in evidence including a number of cannons on the waterfront, mounted on rails to give a greater angle of fire, photo 3. 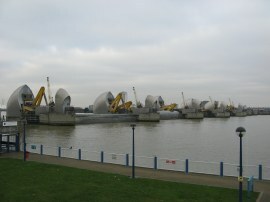 From the station it had been a 1.95 mile walk to the start point of stage 5 of the Green Chain Walk besides the Thames Flood Barrier, photo 4. Arriving at the waterfront one of the barriers was being raised, attracting a large flock of seagulls around the gate as it slowly raised from the water. 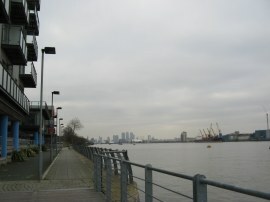 From the waterside the route heads inland up a flight of steps and then follows a tarmac pathway that threads it way through a small strip of gardens for a third of a mile up to the Woolwich Road. Crossing the busy road the route enters Maryon Park where the route of the Green Chain Walk immediately splits into two, photo 5. The main route heading to the left from the park entrance and the alternative route, that goes via Gilberts Pit heading off to the right. 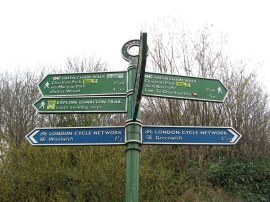 On my walk around the Green Chain Walk I want to walk all the path options on each stage and it was the right hand route of these two options that I set off to walk first. 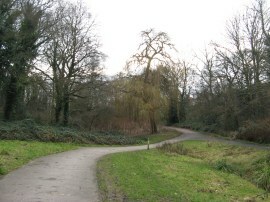 After heading to the right along the bottom of the park for a short distance the route heads along an unsurfaced path that starts heading uphill on the left. 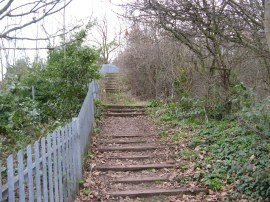 This path winds its way uphill, heading up a number of wooden steps, photo 6, and passing through two sets of metal gates. Shortly after the second, unpainted gate the route heads off to the right along a more level section of path. Continuing ahead at this point more steps lead up a view point over the Thames although the views were not particularly impressive when compared to other places on the Green Chain Walk. 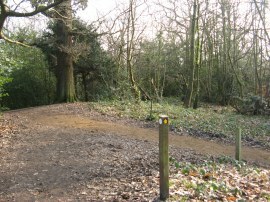 The route then follows a broad path running through the trees close to the edge of the park before heading diagonally across the bottom of the remains of Gilberts Pit, photo 7. 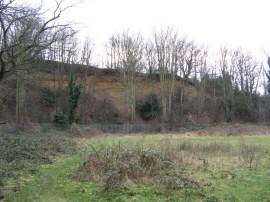 Quarrying began in what was to become Maryon Park, early in the 18th century and continued until 1870, when Gilbert’s Pit was opened. The Thanet Beds (sand) are up to 18 metres thick in this area, and at different depths have different properties. 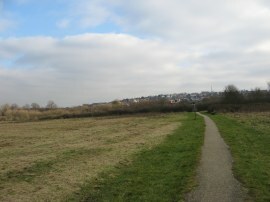 The pit is an SSSI and provides one of the most complete sections through the Lower Tertiary beds in the Greater London area. Leaving the pit the route heads along a fence lined section of path which leads up Thorntree Road. 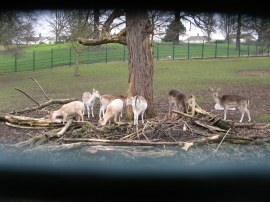 Heading slightly to the right across the road the route then heads into Maryon Wilson park along a tarmac path that runs alongside the right hand side of a small zoo enclosure which contained a small herd of deer, photo 8. Just past the end of this enclosure marks the point where the two routes of the Green Chain Walk, which had split up at the entrance to Maryon Park, meet back up again. Having completed my walk along the alternative route I then retraced my steps back downhill through Gilberts Pit and after half a mile was back at the entrance to Maryon Park from where I then set off to walk the main route of the path. From the park entrance the route follows a tarmac path that heads through the park to the left before bending round past a play area and over some railway lines to reach some tennis courts where once again this stage of the Green Chain Walk splits into two, photo 9. 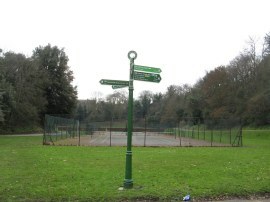 Here the main route follows the path around the right hand side of the tennis courts and the other to the left. The alternative route that heads round to the left at this point is to avoid a steep flight of steps that the main route passes over and it is the alternative route that I followed first. 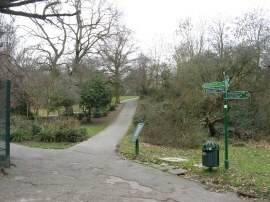 This path bears round to the left of the tennis courts and heads out of the park and turns to the right up Maryon Road. A short distance further the Green Chain Walks turns right into Woodland Terrace by St Thomas' church. 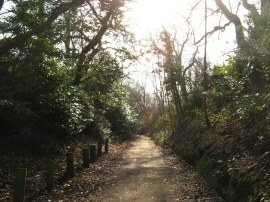 Woodland Terrace heads uphill and reaching the brow of the hill becomes Thorntree Road where, just a few yards further on, the two routes of the Green Chain Walk from Maryon Park meet up again opposite to Maryon Wilson Park. The length of the alternative route was 0.35 mile. Once again I then turned around and retraced my steps down the road to the tennis courts in Maryon Park. Incidentally Maryon park was the location for much of the film Blow Up and the tennis courts feature where the flower children acted out a silent game of tennis without a ball, still recognisable more than 40 years later. 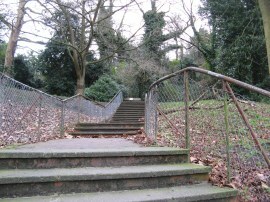 Following the right hand path, which is the main route of the Green Chain Walk and also the route taken by the Capital Ring, the path makes its way round the other side of the tennis courts and around to the end of the open space behind them before taking a flight of paved steps, photo 10, that lead up to the top of the hill. There were more noisy Parakeets in the park and clumps just about to come into flower in the flowerbeds alongside the path. 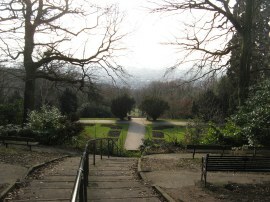 From the top of the steps it is just a short walk across a small area of heathland to Thorntree Road where the route heads across the road, linking up with the step free route, to join a tarmac path that heads diagonally downhill across Maryon Wilson Park, photo 11. This followed towards the small zoo area and reaching the end of the animal enclosures the route then links then back up with the route of the Green Chain Walk that had come up from Maryon Park via Gilberts Pit, photo 12, which I had originally walked. 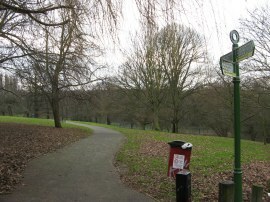 With all variants of the path reunited, the Green Chain Walk then heads to the left along a tarmac path that heads steadily uphill through the park, photo 13, to reach Charlton Park Road. Here the route turns briefly to the right before crossing over the road and heading to the left into Charlton Park where, having passed through a car park the route meets up with the start point of stage 4 which I had walked a couple of weeks earlier. 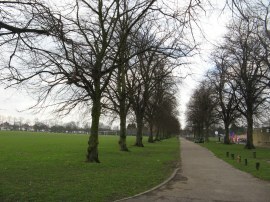 Turning to the right, stage five continues along a tree lined path, photo 14, running alongside playing fields and a childrens play area, the path heading in the direction of Jacobean Mansion, Charlton House, which lies just off the route. Reaching the end of this path the route heads to the left along another tarmac path and just before Canberra Road is reached turns to the left again, running along the grass at the top edge of the park with the playing fields now to the left. About half way along the top edge of the path the route exits through a gate on the right and crosses a road and heads to the right along Charlton Park Lane before heading up the first left which is Inigo Jones Road. This is followed into Hornfair Park, a much blander park than the previous two. 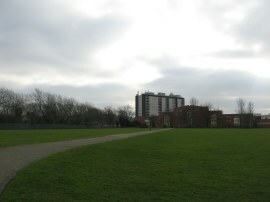 Here the route heads briefly to the right before joining yet another tarmac path running across the middle of the park towards a block of flats, photo 15. Reaching the end of the park the route heads to the left and goes through a gap in the metal fence and bears right through a parking area behind houses to reach a road. Here the route heads to the left along Stadium Road by the Queen Elizabeth Hospital to a pedestrian crossing and then crosses the road and then bears to the left, heading uphill across the grassy slope at the edge of Woolwich Common. Reaching a narrow tarmac path the route heads to the right across the common towards Academy Road with Shooters Hill rising ahead, photo 16. As the path heads out of the tree views started opening up to the left across the River Thames. Just before the road is reached the route heads uphill to the left along a track running to the right of a scrubby patch of trees that runs parallel to the road. Eventually this path curves round to join the road for the final few yards up Academy Road up to its junction with Shooters Hill. Crossing over the road by the traffic lights the Green Chain Walk heads to the left along Shooters Hill, past the old Police Station, before bearing diagonally to the right across an area of grass over an indistinct path that leads into a path of woodland. 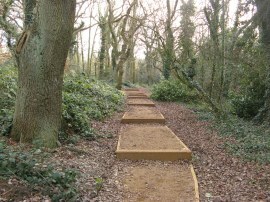 Here the route joins a set of gravel filled wooden steps that head gently uphill through the trees, photo 17. 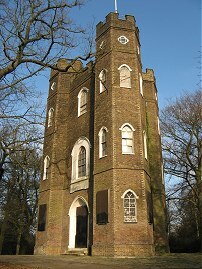 These steps lead up to a driveway where the route heads to the right and after a couple of hundred yards reaches Severndroog Castle. Just before the castle is reached the route once again bifurcates, the main route heading to the right past the castle and the alternative route, which I took first, continuing ahead along the driveway, photo 18. This alternative is once again to avoid a set of steps which are encountered on the main route. Bending round to the left the route joins an unsurfaced section of path by an isolated house the continues heading downhill back to the point where the two route of the path meet up, 0.2 of mile from Severndroog Castle. I then turned around and for the third time on this stage started retracing my steps, this time heading back uphill to the castle to rejoin the main route of the walk. Back on the main route, I followed a path that runs round the side of the castle, photo 20 to join a set of steps that heads down through an area of formal gardens, photo 21, from where there were good views across the south London suburbs. Reaching the bottom of the second flight of steps the route turns to the left along a tarmac track that soon joins a muddy path running through trees where the path soon links up with the alternative route. 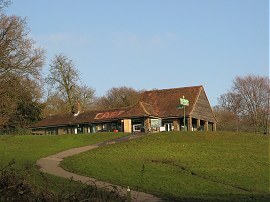 This then leads on to another tarmac stretch of path that heads past another small area of gardens before heading to the right along a path that heads gently downhill, bending round to the left from where it is just a short walk up to the café at Oxleas Meadows which marks the end point of stage five of the Green Chain Walk, photo 22. The GPS 8.02 miles when I arrived at the café which meant I had walked just over 6 miles along stage six, taking into account my there back trips along the alternative routes. I had a short lunch break, sitting on a bench in the sun outside the café in the warm sunshine, and then set off to walk stage 6 which starts a short distance away in Oxleas Wood. While I was eating a very annoying pug like dog, that looked just like its owner, came and kept hopping up around my legs looking for food and dribbling everywhere. From the cafe I followed the route of stage three down through Oxleas Wood to reach the start point of stage 6. It was a very still day and the air was filled with the sound of birdsong as I made my way through the trees, the weather having improved considerably from the start of the day. I have uploaded the route of the days walk, including stage 6 which can be accessed here Green Chain Walk Sections 5 and 6 Route .